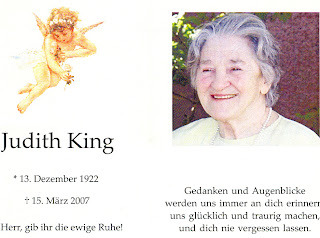 A lovely woman recently passed away, Judith King. She was a very dear, special lady who was so kind to our family. Steven, our good friend in Mannheim introduced us to his mother when we were stationed in the military there. I loved to hear her stories about WWII and what life was like. There are many things I will remember about Frau King. She loved to have guests in her home and would spoil them by setting out her special china and silver and serve delicious coffee and pastries. I remember once she had me over for coffee and I hadn't drank coffee in the last 10 years due to being pregnant and nursing babies. I didn't have the heart to tell her I didn't drink coffee after she layed out such a pretty table! I was so wired from the caffeine of that strong German coffee, (I haven't stopped drinking coffee since!) Frau King tried to teach me to knit in the continental way. Unfortunately I never got the hang of it and am still a "thrower." At Christmas time she still used real candles on her tree!!!! She had our family over and she lit the candles (and yes, the tree did catch on fire!) No big deal though, she simply squirted it with a spray bottle of water! I started quilting in earnest when we lived in Germany and Frau King had me make some items for her. She had a collection of antique white linens and lace that she asked me to cut up and make into a quilt for her. I was very reluctant to cut up such beautiful pieces of fabric, so I was able to persuade her to just cut up the damaged ones. It turned out quite pretty and I hope to make one for me one day. I never thought I would see Frau King again after we left Germany for Colorado. It's funny how life twists and turns and you never know where you will end up. Seeing Frau King again after moving to Holland last year has been one of my highlights of being back in Europe. All three of my children were able to see her again before she passed away and for that I am grateful. She was very special to us. I will miss you, Frau King. This is a quilt that I made for the new millennium. It was part of a charm pack a month club during the year 2000 from a shop in Colorado Springs, Colorado. Needless to say, I got really, really sick of this quilt - and ended up making a small quilt instead. So instead of the 2000 different fabrics it is supposed to have I think it only has a couple hundred. Oh well, I started out with good intentions! I realized the other day that I haven't posted much about the city we live in. Enschede is a good sized city - about 160,000 people live here. Their are several colleges and universities in the area so there are allot of young people here which always is nice - it gives an area energy I think. Enschede is just a few kilometers from the German border so it is in a nice location for traveling. Enschede has a great market on Tuesday's and Saturdays in the downtown center shopping district. European markets are wonderful. Wonderful flower stands, fruits and vegetables and cheese stands. I don't care much for all of the fish stands though. I like my fish without heads and tails on them. Enschede was once a large textile center in the Netherlands, and there are many remaining beautiful villas in town of the wealthy textile owners. We have two old villas in our front yard. Today, most of these gorgeous homes have been converted into businesses. I also picked up a toy barn that a gentlemen had made. I have a collection of German toy farm animals and they needed a place to stay! Ed gave me a horrible time about buying it - but I saw its potential!!! I'm going to paint it and try to turn it into a miniature version of a beautiful Dutch barn that you see in the country here. I'll post pictures when I'm done. Spring has arrived in Holland! The daffodils are out in full force on our patio and the flowering trees are doing their spring thing. It has been a beautiful week - SUN! Wonderful sun!!! Brad was here visiting on spring break, it was great to see him. I haven't done allot of quilting this week - but hopefully I will get back to getting my current projects going again. I did baste my Lone Star and appliqué quilt and started quilting it though. I added a pieced border to it containing the other fabric in the star and appliqué - and I think it will be ok. Ed is playing golf - so I am off to quilt!!! Never in my wildest dreams would I have hoped or believed my girls would ever learn to play nicely together!!! They were born 17 months apart and I think until recently have never stopped fighting! I believe they still have bite marks that they had given each other on their arms from when they were little! I'm glad you both are becoming friends - especially with me and your dad being so far away. You make me proud! Love you!!!! I've been looking through my old quilting magazines and books to get an idea of what I want to do with my Dutch fabrics. I think I've decided to do something with this block . 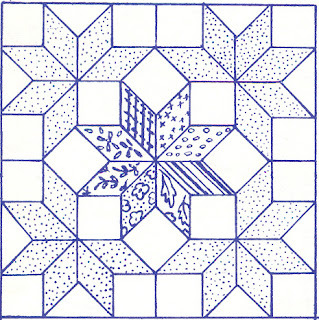 I'm thinking maybe 4 of these blocks set diagonally and then work out from there to make a medallion quilt. I'm not quite sure what to do with the background though. I feel very comfortable with using white or off white for backgrounds - kind of like all the white walls in my house! 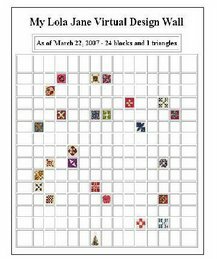 I love to see color on walls and in quilts that people use, but when I use it - I feel it doesn't look right. It reminds me when we lived in Colorado and I decided to paint the bedroom a lovely shade of green, well the bedroom looked like it had toothpaste thrown all over the walls! Needless to say - we repainted it white! You know you are getting old when...................you start telling stories that use to embarrass you and you thought you would never tell! Ed and I got back from Rome a week ago and my ankles are still aching from all the walking we did! It was definitely worth the pain! This was one of the best trips Ed and I have ever had! We flew to Rome on Air Berlin - a charter service out of Germany. I was pretty impressed, our tickets round trip were only 109 Euros! They were actually great flights - I guess if you can call flying great. I think I have flying short distances manageable - I sure still hate those big trips over and back from the States though. I know, get over it! We got to Rome on Monday, checked into the hotel. We stayed at the Residenza Farnese Hotel, close to Piazza Farnese and Campo dè Fiori. The hotel was originally a palace in the year 1000! In the 19th Century, the palace was bought by the Church and became the seat of the Ecclesiastical Institute for the formation of young new priests. We got a great deal from our new best friend, Carola - our travel agent! We headed out for a walk and to find a place for lunch. 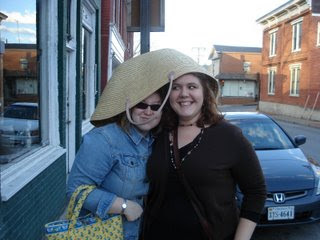 We found a great little restaurant and sat outside - (yeah sun!) The food was wonderful - in fact it was wonderful all week. I have even grown quite fond of expresso! After lunch we headed out walking and were just amazed. Ed had been to Rome for a day several years back, but this was my first trip to Italy, (except for lunch over the border from Austria several years ago - so I don't think that really counted.) I felt like I had been dropped among a movie set. It was difficult to comprehend that this was Rome! While walking, Ed and I came upon a building with ruins around it. Ed got his map out and said, - hmm, this is the back of the Pantheon! We walked around the front and there it was - just like I had seen in dozens of history books. The mosaic tiles and the domed roof were amazing. I know I keep saying amazing, but if I had one word to sum up Rome, that would be it. There were liturgical shops everywhere with beautiful robes, crosses, and altar pieces. And of course lots and lots of nuns and priests. I'm not fond of nuns, I've never had a good experience with one. Maybe, I've just met mean ones - I guess they're allowed to be cranky. When I was 13 I wanted to be a candy striper (volunteer at the local Catholic hospital) and I went with my best friend Debbie to interview with the nun in charge of the program. This delightful nun told me, you know Laura, you should lose weight, boys don't like fat girls! When I was in Rome, I wanted so badly to go up to a nun and say - ha! I found a boy that loves me just the way I am!!!!! I told Ed that story and he made me promise I wouldn't accost a nun while in Rome, he wasn't sure he could get me out of jail. Monday night we went on a tour of Rome at night. I love city tours at night. The fountains and buildings are so beautiful lit up. We saw the Trivoli fountain, so beautiful. I was severely pestered by a rose carrying conman. These guys hold bouquets of roses and give one to the ladies saying they are a gift and once you grab it - you are expected to pay for it. Well one guy would not leave me alone, he would not take no for an answer. Ed stepped in and yelled at him to leave me alone. The guy bumped Ed, and well, you just don't bump Ed. Ed bumped back a little more forcefully, they exchanged a few words and then the guy finally left. Eddie, my hero! Tuesday we headed off to the Coliseum and the Roman Forum. I hadn't realized the Forum was so large and had soooooooooooooo many ruins. Yes, amazing. We had another great dinner out. Wednesday we took a bus down to Naples and Pompeii. The port at Naples is so pretty - so blue. Pompeii was much larger than I thought it would be. There were stray dogs sleeping everywhere. They looked like people were taking good care of them, but it still made me sad. We went on a tour of a cameo factory. Yes, Ed bought me one for our anniversary. It's beautiful! Thursday we went to the Vatican. Wow! We saw the Vatican museum, the Sistine Chapel and St. Peters Cathedral. St. Peters Cathedral is beautiful. I have seen some of the most beautiful churches ever built, but my favorite churches are still the small white country churches that you see in the rural United States. I saw the strangest thing at the Vatican. There was this middle aged man with short hair that had twisted the hair on top of his head to form two "devils horns." I thought he was pretty bold walking around the center of Catholicism, maybe a nun had been mean to him when he was a child also! Friday we took a bus out into the countryside to the Appian Way. So beautiful. We stopped at the catacombs at St. Sebastions Basilica. I actually went down into them! I'm getting brave in my middle age! We had wonderful lunch at a restaurant that use to be the stopping place for travelers on the Appian Way to rest and water their horses. It looked like a dive on the outside, but on the inside it was so charming. Their wine cellar was in one section of the catacombs. We then went on to see the aqueducts and some more of the Appian Way. We ended our stay in Rome with another wonderful meal. The wine was wonderful, though wine and cobblestones streets don't mix well with me! On trips Ed and I usually ask each other what our favorite thing we saw was. I honestly could not give an opinion this time, the whole trip was my favorite! Click here to see more Rome pictures!